All readers of the internet turn with undying devotion and respect to our beloved People’s Daily. Despite the blatantly false lies of a minority of lying liars, those who know anything will agree: The Beijing Olympics are to be the best ever held in Olympic history. 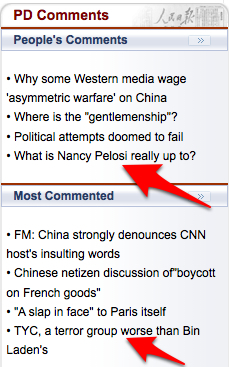 Also, what is Nancy Pelosi Really Up To? And, the Tibetan Youth Congress is worse than al-Qaeda. And, political attempts doomed to fail. And, media abroad have reappraised not only the contemporary China but also its armed forces.